One of Russia’s major banking players, MDM Bank, has rolled out a single-tap Mastercard Contactless mobile payments option. The service is underpinned by the WAY4 Host Card Emulation (HCE) technology from OpenWay. MDM Bank’s customers can now pay from their Mastercard account with no need to enter a password or PIN code or even activate the app before making a payment, says OpenWay. They just unlock their phone via a PIN or a fingerprint and tap it to a contactless reader. The service is currently available only on smartphones running Android 4.4 and higher with NFC support. It runs in offline mode and is optional for customers, the vendor emphasises. Mandatory authentication to confirm a payment can still be set up in the app, if required. Pavel Mikhalyov, director of the development of mobile services department at MDM Bank, notes that there are only “a few banks in Russia” that have deployed HCE technology for mobile payments. Elsewhere, OpenWay has helped B1NK, a digital banking subsidiary of Capital Bank Kazakhstan, to launch the region’s first chat and payments bot – using Telegram Messenger. Round led by Limestone Technology and OpenWay. Hoping to bring “digital cash to everyone,” Samsung has introduced a chip platform that can enable contactless payments in watches, wristbands, key fobs and perhaps even clothing. Türk Ekonomi Bankası is to launch a mobile contactless payment application using Visa Europe’s host card emulation functionality to provide secure contactless payments. Deutsche Bank has launched a new mobile payment app for Android devices. Mastercard is making headway in advancing digital payments for transit passengers in Australia and bike-sharing consumers in Singapore. 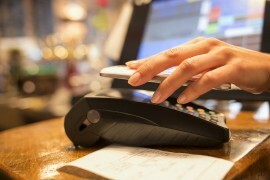 HCE and NFC: threat or opportunity? Mobile NFC services continued to expand in 2013 but the big question is, will this be amplified or disrupted by the introduction of host-based card emulation (HCE) into mainstream operating systems?